Are Phablets the Wave of the Future or a Passing Fad? Phablet sales are soaring, according to iSuppli, a market research company. In 2012, 25.6 million “phablets”—or hybrid smart phones and tablets with screens 5” or larger—shipped worldwide. That number is predicted to reach 146 million by 2016. In fact, phablets are getting so popular, that Dockers has redesigned their signature pants with larger pockets to accommodate the devices. But are phablets are fabulous find or a fad? A phablet is a device that combines the note-taking ability of a tablet with the communication features of a smart phone. Phablets offer screens of 5″ or larger, which makes reading lengthy documents or watching movies easier. One example is the phablet from Samsung Galaxy Note. The Galaxy Note starting dominating the market in 2011. Their use has grown rapidly, with 2013 coined “the year of the phablet” by some pundits, as Marketing Land points out. Discomfort during use: The larger screens may make phablets a pleasure to use for reading, gaming or entertainment apps, but they’re uncomfortable to hold for lengthy phone calls. Appearances: Phablets are bulkier than smart phones, and holding one up to the ear during a call is reminiscent of the bulky cell phones of the early 1990s. Some are just plain unattractive. Difficult to carry: Tablet users know they can’t just shove their devices in their pants pockets. But they expect smart phones to be portable. Phablets still don’t fit easily into most jeans, pants or jacket pockets. And while Dockers may be resizing pockets to fit them, consumers are unlikely to purchase a new wardrobe to accommodate a phablet. Screen sizes have continued to grow, with the newer Samsung models sporting screens up to 6.3 inches. As screen size creeps up, phablets may expand back into the tablet category. The extra weight can also drag on one’s pants, making them both unattractive and awkward to tote around to business meetings. Will Phablets Overtake the Market? Mobile phones currently account for 17% of all internet traffic, according to GFK.com, and that number is expected to grow. Phablets, with their ability to bridge both the world of tablets and smart phones, may speed the growth of mobile internet access even more. 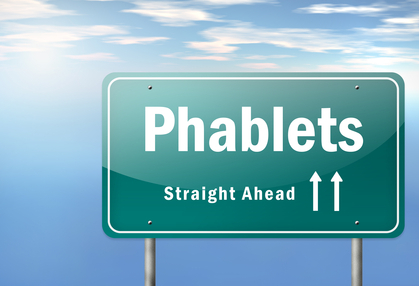 Adoption of phablets will depend on many factors, including consumer acceptance and price.